RBTH presents a selection of views from leading Russian media on international events, featuring reports on a vote by U.S. Congress calling on President Barack Obama to supply Ukraine with weapon, accusations that Israel has been spying on international negotiations over Iran’s nuclear program, and the resignation of two high-level Ukrainian officials mired in a standoff with state authorities. 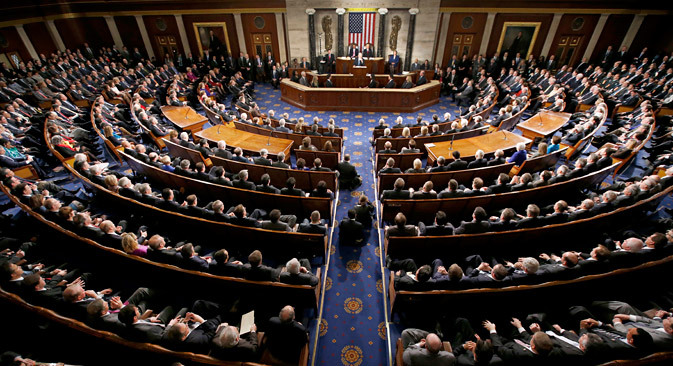 The Gazeta.ru online newspaper writes that 348 members of the U.S. House of Representatives have voted on a resolution calling on the President Barack Obama to start supplying Ukraine with lethal weapons. The lawmakers believe that this will help Ukraine in its fight against pro-Russian rebels in the Donbass region in eastern Ukraine. The publication remarks that meanwhile the Russian State Duma has announced the possibility of restoring to President Vladimir Putin the right to send troops to Ukraine. Obama's administration has still not decided whether to supply weapons to Ukraine, however, this may be a possibility in the event the Minsk Agreements are not implemented. Experts interviewed by Gazeta.ru say that there is no military necessity for supplying arms to Ukraine since the country already has enough weapons to continue the military conflict. However, the potential supplies will have a symbolic meaning: It will be a sign of direct support for Kiev, which Moscow unambiguously perceives as America's direct involvement in the conflict. Yury Rogulev, director of the Franklin Roosevelt U.S. Studies Foundation at Moscow State University said that American lawmakers are trying to put pressure on the U.S. president: "This is a traditional move for American politics – the mechanism for strengthening any diplomatic agreement is military force," he said. Rogulev added that the resolution also has significance for America's internal politics in its relation to the de facto opening of the presidential campaign. The Nezavisimaya Gazeta centrist newspaper reports on the scandal that has erupted around the Iranian nuclear issue: Israeli special services have been discovered to have been collecting information during the closed negotiations between the P5+1 group of international mediators (the U.S., Russia, China, the UK, and France, plus Germany) and Teheran. The newspaper says that the spies had been acting as part of Israeli Prime Minister Benjamin Netanyahu's campaign to pressure the American leadership to obtain harder conditions for Iran in the nuclear deal. According to Nezavisimaya Gazeta, the White House reacted with indignation to the news, while Tel Aviv denied the allegations. Observers believe that the accusations are likely to be true. "Israel will do everything possible to undermine the deal on Iran's nuclear program," said Director of the Russian Institute of Strategic Studies Yelena Suponina. "The Israelis don’t take Barack Obama seriously and hope that in 2016 a figure more suitable for Tel Aviv will win the U.S. presidential elections." Israel is also trying to reach its objective with the help of its partners in Europe. For example, the recent strengthening of France's position on Iran's nuclear program may have been dictated by several agreements between Paris and Tel Aviv, says Suponina. The Kommersant daily business newspaper reports that the embattled governor of Ukraine’s Dnepropetrovsk Region Ihor Kolomoisky and his deputy Gennady Korban have resigned. This happened late on March 24 after Ukrainian President Petro Poroshenko signed a law on joint stock companies implying that the quorum for shareholders could become 50 percent plus one share. Kommersant reminds its readers that the government already possesses this number of shares in the Ukrnafta oil and gas company and that Kolomoisky, who owns almost 42 percent of the company, is trying to prevent a change in management. Kolomoisky is currently in a standoff with state authorities, with Valentyn Nalyvaichenko, head of Ukraine’s security services (SBU), accusing Kolomoisky's deputies Gennady Korban and Svyatoslav Oleynik of involvement in harboring members of the criminal group that last week killed an officer of the SBU. Kommersant adds that the acting governor of the Dnepropetrovsk Region will be Valentyn Reznichenko, who heads the administration of the neighboring Zaporozhskaya Region. According to Ukrainian political analyst Vladimir Tsibulko, Kolomoisky's hands are now untied, he no longer has gubernatorial responsibilities and can act as a businessman. Crimea: Do Amnesty International claims of ‘climate of fear’ have any basis?